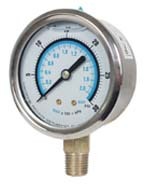 Liquid-filled Gauges are used to dampen the damaging effects of excessive vibration and pulsation. is required. The liquid fluid fill provides continuous lubrication of the internals and helps prevent corrosion. Standard dials are PSI/Bar with 100 = kPa. Other scales and special configurations can be custom built to your specifications. For more information,contact us at 800/323-5111. Other ranges and configurations can be custom built to your specifications.